A couple of weeks ago, there was a post in one of the Adafruit forums asking for suggestions about a "my first SMT" kit. As the industry moves toward SMT devices, it's becoming more and more important for hobbyists to learn to work with the little buggers. At the same time, most people don't want to learn how to handle SMT parts with expensive devices and complicated circuits. That's certainly how I felt when I first started working with SMT parts, so I built my own set of DIY-able tool/circuits. 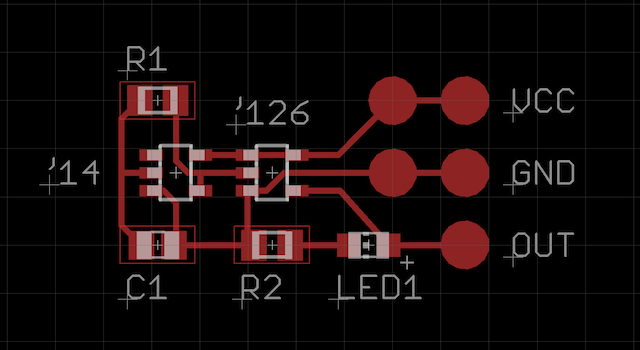 The theory was that I'd practice building small, cheap circuits that wouldn't cause too much pain if I screwed something up, and would have a more or less useful product when I was done. 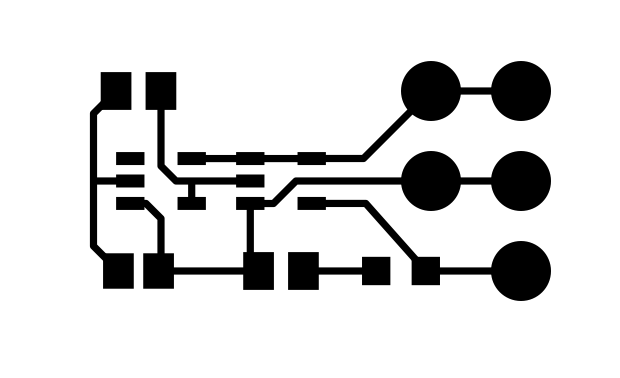 I have several such circuits by now, so I told the forum I'd post the relevant files online under an Open Hardware license. .. Then I went back and looked at A) the files and B) my blog. The project files were standard "just doing this for my own use, and I know what to ignore and what to work around" fare. They were also SVG files done in Inkscape, because getting vector files out of Inkscape is a slightly less miserable process than getting usable artwork out of Eagle. The blog was neglected due to organizational problems that I'd always planned to fix with software "eventually. " The actual workflow of writing and posting an article wasn't so bad, but linking a new article into the site as a whole was a pain in the neck. I decided to tackle the blog and its workflow first, with the SMT tools coming second. I have several designs to publish, and didn't want to fight with a craptastic content distribution system while also wrestling with the projects themselves. Obviously, I've made some progress on the workflow. 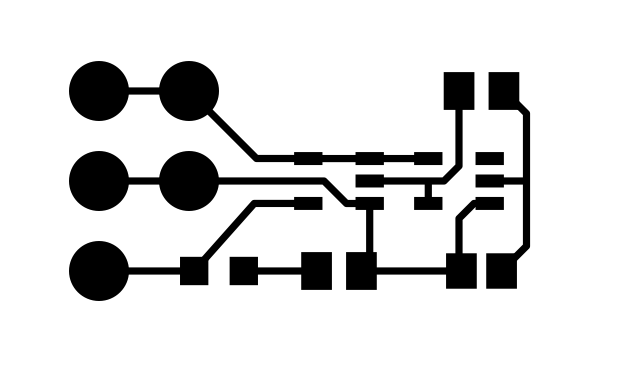 I've been writing and posting articles for a week, and am comfortable enough to start working on the circuits. So.. here's the first circuit: a square wave generator. It's the same one I talked about a couple years ago, but cleaned up for public consumption. And there's a PDF version of the same thing if you want arbitrary precision. You can also download the Eagle .brd file and the Eagle .sch file if you want to play with the design. There's a fair amount of flexibility when it comes to choosing the parts. I've listed LVC series chips for the inverter and buffer because that's the newer and (usually) cheaper technology that still accepts supply voltages up to 5v. You're free to use HC, AHC, etc. if you find cheaper parts in that line. Don't use the HCT, AHCT, etc. families though.. the thresholds are different and it can screw up the oscillator. By the same token, you do need a Schmitt trigger inverter. The hysteresis is what makes the oscillator work. Regular inverters will just sit there with the input and output balanced at Vcc/2. You can adjust the R1 and C1 values pretty broadly.. I've built ten-megohm/ten-microfarad versions that plod along at one pulse every few minutes, and the LVC series of chips are rated for speeds in the mid-megahertz range. At a kilohm, R2 only allows three or four milliamps through LED1, but that's still plenty bright to see. Adjust to taste if you want more oomph in your blinky. As far as sourcing parts goes, I buy most of my parts from Mouser, but you're welcome to use whoever you please. If you buy one of each component (I'd love to see the warehouse guy's face for that order), your total parts cost would be about 35c, assuming you didn't use a blue or white LED. If you did decide to go blue or white, the total parts cost would be in the 50-60c range, and the LED would cost as much as all the other components combined. Buying in lots of 100, the cost would be about half that. I'd have to get PCBs made, and a run those usually costs about $500. I don't have my own online store (yet), and can't send hordes of minions to nag an existing distributor. This isn't my only beginner-friendly SMT design by a long shot. As I said above, I'm still getting comfortable with a new self-written blogging package and workflow, and I'm still tweaking the code at least twice a day. I'm scheduled to do a major software migration for a client later this month, and that will fill my manual-reading quota for at least a couple of weeks. I'm looking at ZenCart since it's Free and Open, and the gang at Adafruit have been generous enough to share their ZenCart experience with the rest of the Maker community. ..that will take a while though. For the short-to-mid term, I want to get the rest of my designs ported to Eagle, which will probably involve building, testing, and bulletproofing new versions of each before I feel comfortable unleashing them on the world. Once all the designs are online, I'll start checking around for interest. If it looks like a significant number of people would be willing to buy some or all of them, I'll look into starting a Kickstarter campaign to fund the first batch of parts/PCBs. I'll have further updates as events warrant. In the meantime, all files in the tarfile or zipfile are available under the terms of the TAPR Open Hardware License Version 1.0.